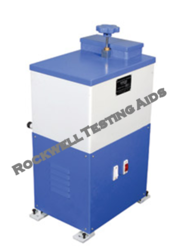 Our product range includes a wide range of end quench hardness test apparatus. After heating, the test specimen is kept on the specimen support, where it is automatically centered with respect to water jet. The quick action valve starts impinging the water jet on the specimen end instantly. The elaborate arrangement of pump, tank, pipe etc. enables to obtain desired correct water head for the nozzle. The electrical controls and safety devices for pump & motor are provided and the entire apparatus is totally enclosed.